Temps in the mountains have reached up to the 80s this week. It's beginning to feel like summertime! My younger sister has been taking me stand up paddle boarding whenever we get a chance to go. (Thanks, sis!) Last weekend it was to one of the high mountain lakes that I hadn't yet been to. The water was so clear across most of the lake that it was hard to tell just how deep it was. 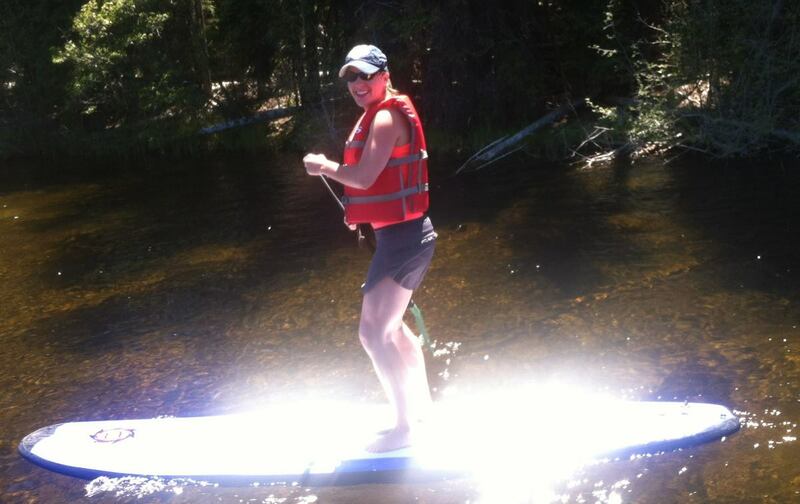 I've now been paddle boarding a grand total of three times, but can boast that I haven't fallen in yet. Although, with the way the wind was blowing over that lake last weekend, I came mighty close. No thanks to my sister for laughing and making fun of me. I'm not sure yet if we'll find time to load up the boards and go this weekend. But the sun is supposed to be shining, so there should be plenty of great opportunities for it. What summer activities are y'all up to lately? Have you tried paddle boarding?